Even though Father MacRae, is may not be a priest of your diocese, I would ask you to spiritually adopt him as I have done, during this Year for Priests. When praying please pray for the souls of our families, our friends, our enemies, all pagans, all priests and religious, the just, all sinners, and for the souls who have no one to pray for them. Remember that the month of November is set aside for the Holy Souls in Purgatory and they receive more graces during the month of November. When we sin and repent of our sin (repentance means asking for forgiveness with the intent of not repeating the sin), God will forgive us but we still have to pay for the damage we caused due to the sin. The damage is the "stain" we leave on our souls when we sin. Even though we are forgiven, the stain remains. It should be understood that when we sin, it produces two effects on our souls: the debt of guilt and the punishment due to that sin. We are guilty of both and deserve punishment. When we repent of our sin, the guilt is removed but the stain remains. The souls in Purgatory must expiate for their temporal punishment due to their past sins. When the debt is paid they acquire Heaven. An indulgence is the remission of the penalty due to sin, or in other words, it is a ‘payment" to remove the stain of pain from our souls. The payment can be made through prayers, acts of charity, and acceptance of the suffering we endure throughout our lives. There are two types of indulgences: partial and plenary. A partial indulgence is the easiest one to obtain. It will remit a part of the penalty of the sins we have committed, while a plenary indulgence will remove all of the stains of sin in our soul. In order to get a partial indulgence, we must have the intent of obtaining the indulgence, we must be in a state of grace (repented of all of our sins), and say the prayer or perform the act which would lead to an indulgence. We are permitted by the Church to get as many partial indulgences each day as we wish. A plenary indulgence is more difficult to obtain. 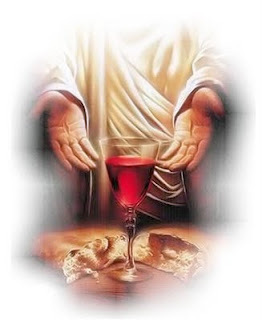 In addition to the conditions attached to a partial indulgence, we must go to Confession and receive Holy Communion. We must also pray for the intentions of the Pope by praying one Our Father, one Hail Mary and one Glory be. A plenary indulgence can be obtained only once per day but those who are in danger of dying may receive a second plenary indulgence in the same day. We can apply the indulgences to pay for the sins we have committed, OR we can apply those indulgences to remit the penalty of sins for the souls in Purgatory. 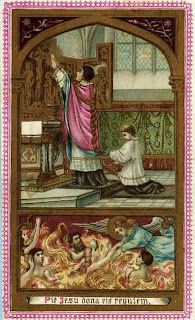 When we give our indulgences to the holy souls, it will shorten their stay in Purgatory, give them some comfort, and may release them from Purgatory sooner if their soul is completely purified from the stains of sin. A partial indulgence given to the poor souls in Purgatory will shorten their time there, while a plenary indulgence has the great grace of completely purifying the soul and allowing them to immediately entering Heaven. Unfortunately, in order to be granted a plenary indulgence, we must be completely free from the stain of sin which is difficult to do. But we should always try. If the indulgence is not granted, it will at least be partial and will provide some benefit for the souls. It is a great act of charity and mercy to pray for the dead. The holy souls will not forget what we have done for them and they will repay us a thousand times over for all we do. May God have mercy on them and may we pray for them every day. The Five Promises of Our Heavenly Mother to those who offer their lives to Her through "The Life Offering"
2. Their life offering, together with the infinite merits of Jesus, can save many souls from damnation. All souls who will live until the end of the world will benefit from their life offering. 3. None of their family members will go to hell, even if it seems otherwise, because they will receive, in the depth of their souls, the grace of sincere contrition before their soul departs from their bodies. 5. I will be with them at the hour of their death. They will not know Purgatory. I will carry their souls straight to the Presence of the Glorious Trinity, where they will live with me in a special place created by God and will rejoice forever. "My dear Jesus, before the Holy Trinity, Our Heavenly Mother, and the whole Heavenly Court, united with your Most Precious Blood and your sacrifice on Calvary, I hereby offer my whole life to the intention of your Sacred Heart and to the Immaculate Heart of Mary. Together with my life I place at your disposal all Holy Masses, all my Holy Communions, all my good deeds, all my sacrifices, and the sufferings of my entire life for the adoration and supplication of the Holy Trinity, for unity in our Holy Mother Church, for the Holy Father and priests, for good priestly vocations, and for all souls until the end of the world. Oh My Jesus, please accept my life sacrifice and my offerings and give me your grace that I may persevere obediently until my death. Amen." A Prayer Warrior sent us the following: These are very evil times in which we live and everyone must be on guard. The Church has given us from Our Lord many weapons to help us in our daily battle against the prince of darkness. Jesus said that we should lay up riches for ourselves in heaven. Well, we always tell others who are in the world that they will never see a Wells Fargo or Brinks truck in a funeral possession. Today, there is too much false compassion and it clouds good judgment. The gifts of the Holy Spirit are needed to keep one with a good and right conscience and discernment. 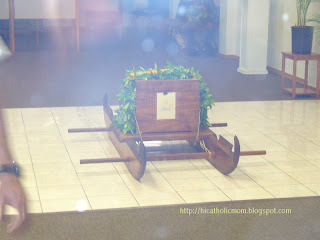 We enjoy praying for the Holy Souls as they will never forget us. It is part of the real Christian brotherhood of Love: The Saints in Heaven, the Holy Souls being purified in Purgatory, and we, the Church Militant! We, the Church Militant, have a duty to those yet in Purgatory - they have gone on ahead, yet they still need our help, and we can help them, even if we don't know them now, we will reap those graces, because when we pray for "the poor souls in Purgatory" - the Church Suffering - and offer Masses for them, and light candles for them, and pray Rosaries for them, we obtain unbelievable graces, for this act of spiritual mercy. St. Alphonsus Liguori called it "A Christian Duty" to pray for the souls in Purgatory. He also said that St. Catherine of Bologna, "when she wished to obtain any grace, had recourse to the souls in Purgatory, and her prayers were heard immediately. She declared that, by praying to those holy souls, she obtained many favors which she had sought through the intercession of the saints without obtaining them. The graces which devout persons are said to have received through these holy souls are innumerable." 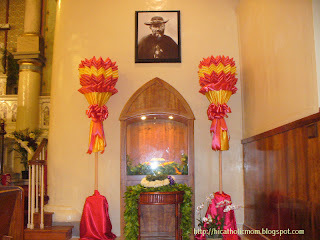 Because of the St. Damien celebration on All Saints Day, I did not have a chance to post on the Feast Day of All Saints. 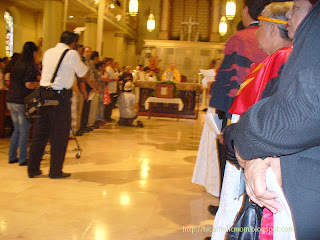 As you can see, St. Rita of Cascia (actually of Hawaii) made an appearance at the Mass. Thank you Theresa for letting me share Rita's photo! 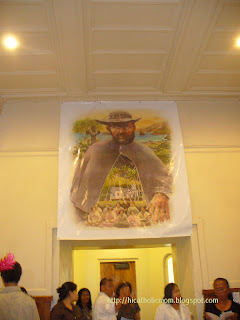 I hope you enjoy these pictures by some of our favorite nuns over at Moniales OP. I would have shared one of their photos here but I did not want to ruin the fun :-) See if you can guess which two are my favorites. The Anglican perspective on Mary -- and also that of the Lutherans, Presbyterians, and some other Protestant Churches -- has been consistently drawing closer to that of the Catholic and Orthodox Churches. This is especially evident in the liturgical and devotional life of these Churches. A brief, historical overview of Mary’s place in Anglican practice clearly attests to this. In the 16th century Reformation, England, previously known as “Our Lady’s Dowry,” experienced a gradual elimination of devotion to Mary in opposition to Catholicism until almost nothing was left. The few remaining vestiges later enabled a rebirth of interest in Mary when an improved theological climate prevailed. The movement of the “Caroline Divines” in 17th century England saw a return to many Catholic values. This movement exerted a definite influence, but was not able to make significant changes in the liturgical prayers. Came the 19th century and the Oxford Movement expressed the desire to enrich the devotional and liturgical life of Anglicanism. Gradually this gave rise to the demand for a complete reform and revision of liturgical texts in the 20th century in the various Anglican Churches, especially in the Church of England. 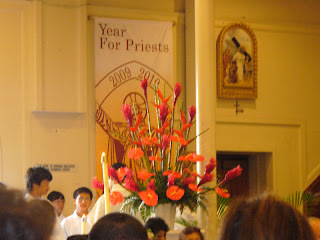 For example, the observance of August 15 was authorized as the principal feast of Our Lady in most Anglican Churches, but the title of the Assumption is avoided. Several influences have contributed in modern times to this revival and advance. Certainly the change in ecumenical climate, especially since the Second Vatican Council, has been a major factor. 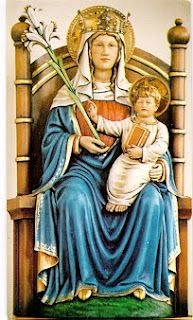 In the forefront has been the Ecumenical Society of the Blessed Virgin Mary founded in England in 1967, and its counterpart in the United States. The restoration of the ancient and revered sanctuary of Our Lady of Walsingham has played no little role. This shrine is a frequented place of pilgrimage for Anglicans, Orthodox, and Roman Catholics. 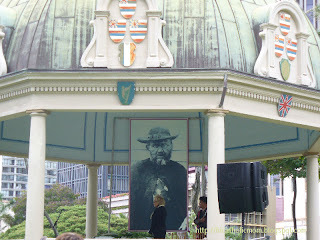 The revival of sacred art and music to bring Mary to the eyes and ears of Anglican worshipers has also been effective. Even the feminist movement has led to an increase of interest in the figure of Mary in circles not touched by High Church renewal. The coast is clear in this area of reunion. 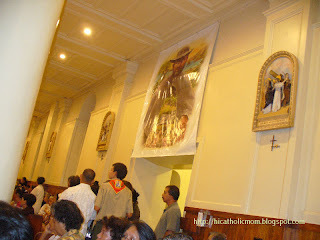 The Blessed Virgin Mary is most definitely a bridge to reunion among these Churches. Our goal and prayer: To the greater glory of God and the Virgin Mother of God. 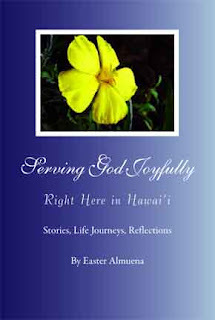 It is a honor and a great pleasure to review Easter's new book, Serving God Joyfully: Right Here in Hawaii. This book is a wonderful compilation of the best of Catholic Hawaii. It seemed like only yesterday that Easter shared with me her brainstorm that resulted in this book. 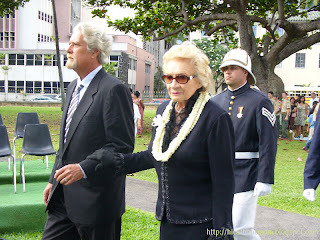 Her idea was formed in part to support our priests and to help the homeless here in the Aloha State. She wanted so much to use the proceeds from the book sale to go for their assistance. She worked diligently and tirelessly right until the book was actually published. 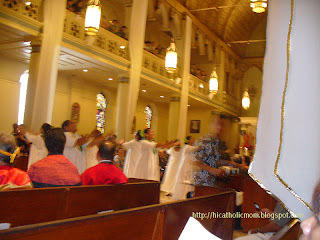 Her work involved contacting many, many people around the diocese of Honolulu. I am sure many times she must have asked herself "Is it worth it?" As her friend I can honestly say, "you bet it is was worth it, Easter!" This book is a Chicken Soup for the Catholic Hawaiian Soul (if you pardon the much used adage and description for an inspiring anthology book). If you are a resident here in this beautiful place we call home, and especially if you are a Catholic, this book is at many times, the healing balm you may need to bring you closer to our God. For me personally, it touched my heart and soul many times when I was not expecting it to. 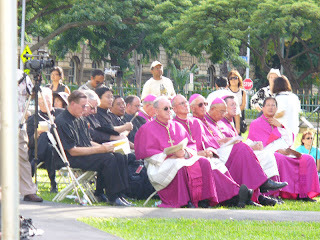 Like most practicing/devout Catholics here in Hawaii, we more or less know or know of each other. After all, this is not a really big place. 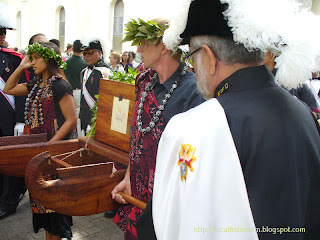 Being a Catholic in Hawaii means you are part of a special ohana. 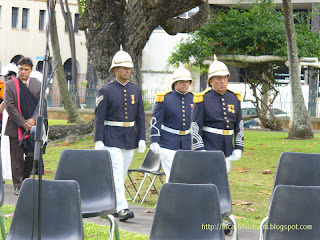 Well some of our ohana members shared their special stories for Easter and for us, the reader. Easter gave me a copy of the book (almost right off the presses) on a Sunday afternoon. She showed me where she lovingly inscribed it for me. I could not wait to go inside and start reading the long-awaited for book. Of course, I started off with the stories written by by friends or those of whose names I was very familiar with. I think the first story I read was Pat P's story of her son who had contracted AIDS. She is a fellow parishioner and I was very familiar with her story and her sorrow. Another fellow parishioner's story I read that afternoon was Steve Odo's. His was a story of reversion I had known about and found inspiring because of the many Catholics Steve and his wife Caroline have helped come home. There were many other stories by some of the spiritual moms of priests, homeschooling moms, seminarians, a priest and other people who do a lot for the diocese's spirituality whose stories I was also familiar with or had heard. But it is an entirely different experience to read their own words in print. 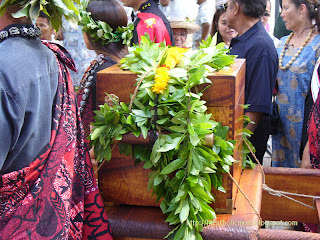 One story was by my friend Dottie M.. She shared memories of her father. Having lost my father seven months ago, this one was one that touched me the most. I know it was hard for Dottie to share her private and personal story because it was so precious to her but she felt compelled and prompted by the Holy Spirit to do just that. That is another thing I found very moving. Not a single person who shared a story did so out of any vainglory or self-serving purpose. On the contrary, each and every story reflects the sincerity and humility in the hearts of these individuals, who simply love God and want to serve him faithfully and joyfully. There were a few stories by people I did not know. Some of them really surprised me because they were sometimes stories that I could relate to personally. There was one dear lady who felt she did not have much to write about. 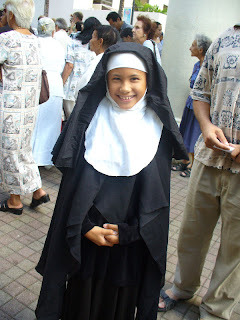 She had always been a faithful Catholic and continues to serve the Lord in her daily life. I liked that. I am glad she shared her story. An additional and personal reflection by Easter, follows each story. This personal touch by Easter, made this book even more special. She engages us and challenges us to really reflect on what the writer was trying to convey through each particular story. 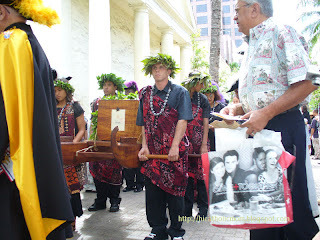 Lastly, you can see clearly how Easter brought our community, our ohana, together. Many of us did our small part in helping Easter when she asked. I know Easter wanted us all to share in this moment with her and all the actual writers. She also tries to help Catholic apostolates, organization and Catholic businesses by listing them in the back of the book. 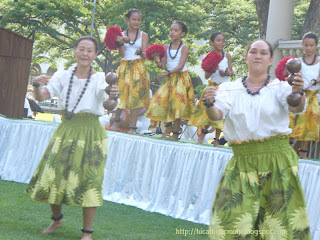 She is an unselfish servant of God who lives her life joyfully right here in Hawaii! 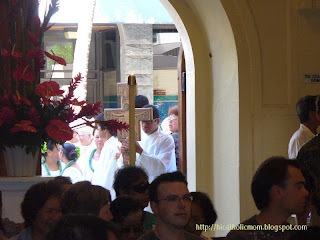 Easter, you are a true blessing and inspiration to Catholics not only in Hawaii, but everywhere. 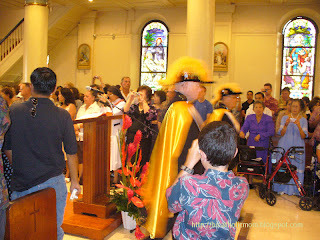 BTW, there is also a message by our dear bishop of Honolulu, Bishop Silva. 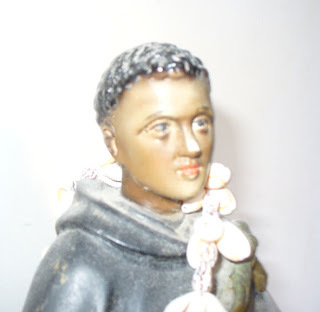 Lord Jesus Christ, who said "ask and you shall receive" we humbly ask that through the intercession of Saint Martin de Porres, listen to our prayers. We ask you to renew the miracles that through his life, were granted through his intercession, obtain for us the grace we ask, if it be for the good of our souls, so be it. Please visit Angels, Wonder and Miracles of Faith for an interesting post on St. Michael the Archangel. Thank you Loci! most sweet embrace in paradise. Our Father, Hail Mary, Eternal Rest, etc. Note: If you pray the above prayer or any other prayer for the intentions of the Holy Souls in Purgatory, while visiting a cemetery, from November 1st to November 8th, you will gain plenary indulgence, under the usual circumstances. 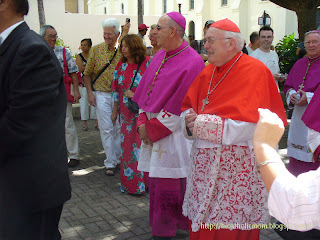 This is Bishop Larry Silva in the photo along with visiting Cardinal Godfried Danneels, archbishop of the archdiocese of Malines-Brussels and primate of Belgium. Here they are waiting on Fort Street Mall, waiting for the procession to commence. 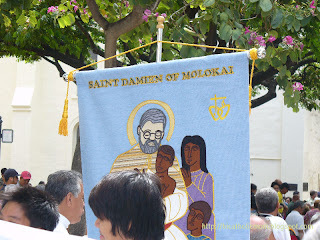 These are photos of Saint Damien's relic that was installed at the Cathedral of Our Lady of Peace, Honolulu, yesterday by Bishop Larry Silva. 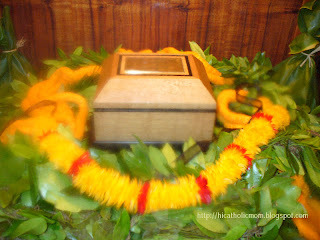 It is enshrined in a beautiful Koa reliquary underneath the photograph of Father Damien.